If you travel to Giethoorn by car. 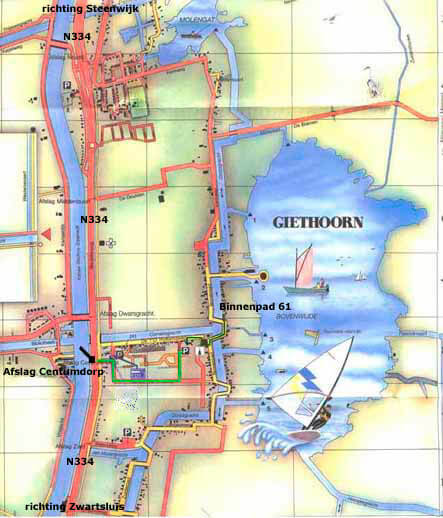 It is recommended that the last part not to drive with navigation, you reach in almost all cases to the wrong side of Giethoorn. Please use the information below. From Zwolle A28, then A32 direction Meppel, at Meppel take exit 3 N375 direction Giethoorn. Continue the N375 to “Beukerschutsluis”, here at the roundabout turn right direction N334 Giethoorn, continue the N334. From Heerenveen A28 take exit 7 Steenwijk Noord. Take N334 direction Giethoorn. Follow in Giethoorn the N344, as well if you think I leave Giethoorn again. From Amsterdam. Emmeloord follow the N331, then the second exit on the roundabout you are now on the N333 direction Blokzijl. On this road take the exit N334 direction Giethoorn. Follow in Giethoorn the N344, as well if you think I leave Giethoorn again. Giethoorn take exit “Centrum dorp“. At the end of the road (+ 25 m) turn right, then first left (Weth. Harm Molweg). Near the end of the road on your right is the public parking. From here you walk into the village (turn right), pass the church left over the high bridge. After the first low bridge leave the asphalt path and follow the small path below. At the end of the path you have reached your destination. If you travel by train to Giethoorn? During the week there is a different timetable than in the weekend. A chip card (OV jaarkaart) is recommended. There is a convenience ticket on the bus for sale for rates see: Connexxion. Giethoorn: get off at the stop “Dominee T.O. Hylkemaweg”. From here you walk till the and of the Dominee T.O. Hylkemaweg (boulevard). Pass the church left over the high bridge. After the first low bridge leave the asphalt path and follow the path down below. At the end of the path you have reached your destination.